To order, print and complete this form and mail it to the address below. Please Contact Kathie Alyce direct at Waterfall Quilts for Wholesale Orders. 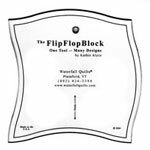 FLIP FLOP BLOCK Acrylic Template - ON SALE! 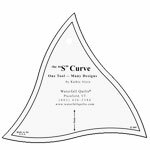 KA031 The "S" Curve Acrylic Template - ON SALE! KA035 "S" Curve - Line Dancing - NEW! KA061 The Squiggler Acrylic Template - ON SALE! KA064 Squiggler - Version #3 - Halves and Thirds - NEW! KA065 Squiggler - Version #4 - Mountain Waves - NEW! KA066 Squiggler - Version #5 - Curving Coins - NEW! KA041 The Para Block Acrylic Template - ON SALE! KA051 The Boomerang Block Acrylic Template - ON SALE! PLEASE PROVIDE CREDIT CARD INFO BY PHONE OR MAIL TO PROTECT YOUR CREDIT CARD.